Thank you very much to Dominique Eichi for including me in her selection of art bloggers for this award. 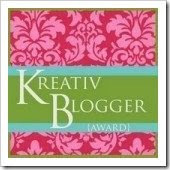 Please go check out her blog and the other recipients of the award! I am going to pass this award along to seven other artists for their impressive art blogs. Also, here are 7 things about me that you might be interested to know:. 1. I don't understand how anyone can be bored! 2. I love my family, my friends and my cat. 3. I am horrible at directions because I am always looking for beautiful scenery to paint, or just to enjoy. 4. My grandkids make my heart smile. 5. I am so thankful for the gift of my art. 6. I love to teach and pass on my love of art. Kathleen Harrington for her beautiful artwork and her kind spirit. Lyn O'Neal for starting her blog! Pat Koscienski for her phenomenal imagination . Anne C. M. Campbell for her painting 'Heaven', and all of the other lovely paintings on her site. Kim Ratigan for her amazing animal paintings. Linda Blondheim for her exquisite landscape paintings. Karen Reitz-Green for her wonderful talent and luscious use of color. These artists are so fabulous go check them out . 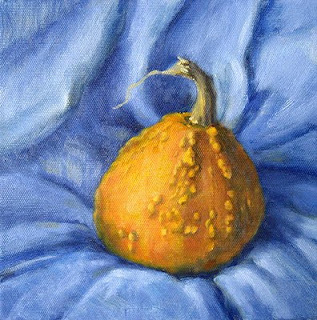 I had some really interesting gourds growing in my garden this Summer, and have anxiously been waiting to paint them. 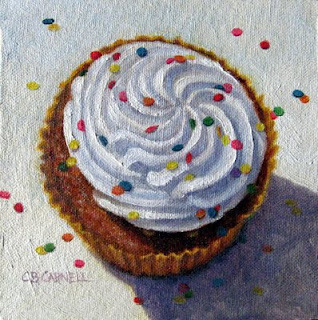 Here's one of the bumpy little fellows that I chose to paint first. A new project from Karin Jurick and her Different Strokes from Different Folks challenges! This has been so much fun, and I really have enjoyed seeing all the different paintings that have been created. This is a painting in progress. Was standing along the Yellow Breeches one day doing some plein air painting when this mother duck and her babies came paddling by. I was so glad that I had brought my camera with me! 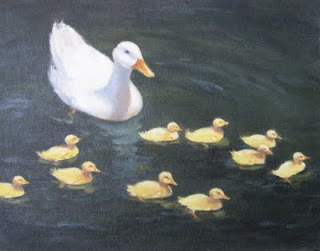 Want to add more color and reflective qualities to the water, and do a little more work on the ducklings.